What Are the Healthiest Fruits and Vegetables? Do you know the most important facts about beets and how they can benefit your nutritional needs? If you're a vegetarian, one of the best vegetables full of vitamins and taste is the beet. Learn the facts about beets and how to incorporate this healthy vegetable into the diet. Beets or Beta vulgaris are a member of the Caryophyllales family, which includes among other things, spinach. Beets have been reported as being seen in the Hanging Gardens of Babylon, one of the seven ancient wonders of the world. Both Greeks and Romans found all sorts of uses for the beet including medicinal uses and as an herb to enhance food taste. Romans felt the beet to be an aphrodisiac. Betalain is the source of color for the red beet; it is also responsible for the color of the beautiful flower plant, the bougainvillea found mostly in the US in the Southwest. A famous stew or soup made from beets is borscht, a soup found primarily in Eastern Europe. Beet juice has been used as both a dye and a drink full of antioxidants. In Australia, locals are fond of placing pickled beets right on their hamburgers much as we do in the US with pickles. The most common beet in the United States is the Red Ace beet and each cup of beets has about seventy-five calories. Beets are full of vitamins and antioxidants. Beets contain nutritional elements such as betaine, folate, iron, and fiber. Betaine has been found to fight and prevent heart disease. The pectin found in beets helps bind toxins, excess hormones, and heavy metals keeping our livers healthy and clean. The health benefits of the beet are vast and include help for cancer patients by drinking beet juice and the improvement of digestive system problems. Another fact about beets is that it can help promote healthy LDL cholesterol levels. The root of the beet has been recommended by herbalists to help prevent lung cancer and skin cancer. In animals, colon cancer has been slowed through the use of beet fiber. 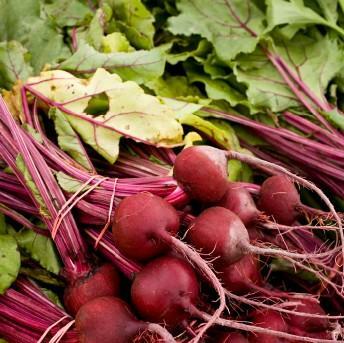 To reap the benefit of the beet, the red beet is recommended the most by nutritionists. Most nutrition experts recommend the red beet and suggest you ingest the entire beet so you don't lose the value of the beet fiber. White, yellow, and striped beets may be nice to look at and taste juicy but only the red beet has been shown to have both nutritional and healing powers. Find great beet recipes like roasting beets, beet chips, beet risotto, and even by using beets with goat cheese for a great appetizer. Beets have been around since 800 BC and used commonly by 812 AD. By 1975, the beet was made into a Borscht soup and sent to the Apollo 18 astronauts. Beet dye is a fun way to dye eggs and clothing. Hard-boiled eggs soaked in beet juices from canned beets will absorb a reddish color for an inexpensive and easy egg dye. Clothing can also be dyed from canned beet juice. Simply drain about two cans of beets and pour into a container large enough to hold the piece of clothing you are dyeing. Allow the clothing to soak in the beet juice until it reaches the color you want. The facts about beets and its uses are endless. Enjoy beets as part of your vegetarian diet or use them as dyes or to help you with your antioxidant and health needs.